CONTACT Offices 1305 Carter St. Chattanooga, TN 37402 Phone 423.265.9494 Fax 423.266.2335 Email info@chattanoogapulse.com Website chattanoogapulse.com Facebook @chattanoogapulse THE FINE PRINT: The Pulse is published weekly by Brewer Media and is distributed throughout the city of Chattanooga and surrounding communities. 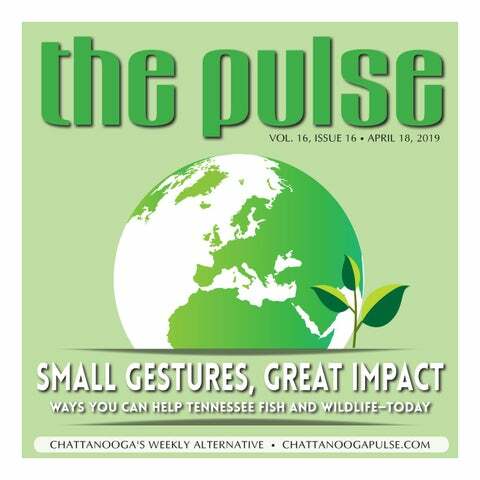 The Pulse covers a broad range of topics concentrating on music, the arts, entertainment, culture and local news. The Pulse is available free of charge, limited to one copy per reader. No person without written permission from the publisher may take more than one copy per weekly issue. The Pulse may be distributed only by authorized distributors. 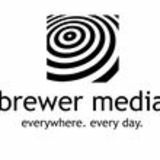 Contents Copyright © 2019 by Brewer Media. All rights reserved. Small Gestures, Great Impact This Monday, April 22nd, marks the 49th observation of Earth Day. Conceived in the aftermath of the 1969 Santa Barbara Oil Blowout, in which three million gallons of oil created an 800-square-mile slick that killed over 10,000 dolphins, seals, sea lions, and aquatic birds, its mission was to inspire environmental awareness and to promote policy change. Earth Day is upon us once again, though to judge by what’s been happening in Washington, DC, one would think certain politicians would like nothing better than to rename it “Destroy The Earth Day”. Geologist (real name: Brian Weitz) from Animal Collective will perform an uncommon solo set in Chattanooga on April 21—just one of around 20 solo performances he’s ever done. On Chattanooga’s Southside, across the parking lot behind the new Moxy hotel, a striking collection of oil paintings is being created by Rik Herrmann at the WanderLinger Brewing Company. Grief is a powerful emotion. The cruelest aspect of our evolution is the knowledge of the difference between life and death. Animals are instinctual—they protect themselves from harm. “None of us are getting out of here alive, so please stop treating yourself like an afterthought. Eat the delicious food. Walk in the sunshine. Jump in the ocean. Say the truth that you’re carrying in your heart like hidden treasure. Be silly. Be kind. Be weird. There’s no time for anything else.” — Anthony Hopkins When you have a “big experience”, such as a graduation or wedding, a birth, a death or break-up, you can’t help but measure life differently. Life prior to the event, and life after. And if you’ve ever had a near-death experience—perhaps getting out of the way in the nick of time, avoiding some sudden tragedy, etc. —then you’ve felt the rush of adrenaline that has you taking a deep breath, and wondering why you were spared. Whatever it is that recalibrates your appreciation for life, consider seeing it as an opportunity. An opportunity to say yes to dancing, laughing, singing. Say yes to being courageous. Say yes to life! ARTH DAY IS UPON US ONCE AGAIN, THOUGH TO judge by what’s been happening in Washington, DC, one would think certain politicians would like nothing better than to rename it “Destroy The Earth Day”. the enormity of the undertaking, a condition in which an individual’s contributions may feel insignificant. Fortunately, even small acts of personal responsibility can have a dramatic impact. It’s a point I’d like to make, and as “all politics are local”, I’d like to begin with a personal anecdote. My love affair with the great outdoors began at the tender of age of three. That’s when my grandfather, armed with a couple of cane poles and some bread for bait, took me fishing for the first time. Suffice it to say, I was hooked (figuratively). There are many people who have ethical qualms with angling, and that’s certainly a conversation we can have, but the takeaway should be that an appreciation for the natural world comes more readily to folks who have a direct interaction with it. At least, it should. cause all the stores already have their *&#% Christmas decorations out! 15—Asteroid strike! Ha! Stupid humans! You should also be investing in finding and deflecting Earth-crossing asteroids. You are burned, crushed, and vaporized. 16—It’s Da Bomb! “Da Bomb Cyclone” that is! In April? Who knows? This stuff is happening year-round now, and Oh. My. God. The Christmas decorations are already up at the mall!! 17—Your grandkids decide that if you don’t care about them, then they shouldn’t care about you. The under 30s rise up, kill us all and use our bones to rebuild the coral reefs. But first, they convert your prized Corvette into an electric vehicle and run you over with it. 18—You have a heart attack from your anger at this column. Unfortunately, all the first responders are dealing with disasters brought about by climate change. They arrive too late. 19—You have died of dysentery. This is the best you can hope for, as your inability to do basic math doesn’t give you much of a chance of survival anyway. Merry Christmas, Corpses! N CHATTANOOGA’S SOUTHSIDE, ACROSS the parking lot behind the new Moxy hotel, a striking collection of oil paintings is being created by Rik Herrmann at the WanderLinger Brewing Company. the work of Tim Warner, Eric Keller, Eric Turner, Cory French, BeBe DeGord, Van Gogh, Dali, Jongkind, Millet and all the French Impressionists, Mark Maggiori, and Chris Long. “The fear of being good inspires me. I don’t want to be a good artist—I want to be the best artist you’ve ever seen,” he explains. “Will I get there? Hell no...but it won’t be for a lack of dedicated, focused, and tireless effort to achieve greatness.” There are several brands of oil paint that fill his palette, ranging from Gamblin to Grumbacher to Winton & Newton to Rembrandt to Van Gogh. His brushes are a hodgepodge of almost exclusively impulse purchases. His process is relatively simple: he sees something awesome, and tries to paint it. SATURDAY4.20 EarthDayz 9 a.m. Rock City Gardens 1400 Patten Rd. (706) 820-2531 seerockcity.com Hug-A-Bunny Days 9 a.m. Chattanooga Zoo 301 N. Holtzclaw Ave. (423) 697-1322 chattzoo.org Coffee at Home 10 a.m. Mad Priest Coffee & Cocktail Lounge 719 Cherry St. (423) 541-1395 madpriestcha.com The Plug Poetry Project: Award-Winning Poet Julian Randall 12 p.m. The Edney 1100 Market St. (423) 799-0052 theedney.com “The Life of Christ” 2:30 , 7:30 p.m. Back Alley @ The Mars Theater 117 N. Chattanooga St. (706) 996-8350 bapshows.com Bobby Stone Film Series presents "Dazed and Confused"
EOLOGIST (REAL NAME: BRIAN WEITZ) FROM Animal Collective will perform an uncommon solo set in Chattanooga on April 21—just one of around 20 solo performances he’s ever done. All ages and walks of life are invited to come out, unplug and enjoy a spring evening gathered around a campfire listening to live music in Tatum Park. 6 p.m. Tatum Park 1609 Union Ave.
LIVE MUSIC CALENDAR THURSDAY4.18 Danimal & Friends 6 p.m. WanderLinger Brewing Co. 1208 King St. wanderlinger.com Fireside Latino Nights: Outdoor Concert Series 6 p.m. Tatum Park 1609 Union Ave. Emerald 6 p.m. Puckett’s Restaurant 2 Aquarium Way puckettsgro.com Jazz + Art 6 p.m. The Hunter Museum of Art 10 Bluff View Ave. huntermuseum.org Thursday Night Jazz 6 p.m. The Palms at Hamilton 6925 Shallowford Rd. thepalmsathamilton.com Naomi Ingram 6:30 p.m. Westin Dorato Bar 801 Pine St. westinchattanooga.com Jesse Jungkurth & Friends 6:30 p.m. Mexi-Wing VII 5773 Brainerd Rd. (423) 296-1073 Stringer’s Ridge 6:30 p.m. Whole Foods Market 301 Manufacturers Rd. wholefoodsmarket.com Toby Hewitt 7 p.m. Backstage Bar 29 Station St. backstagechattanooga.com John Von Stein 7 p.m. Trish’s Sports Bar 4762 Highway 58 (423) 269-8400 Webb Barringer 7 p.m. Edley’s Bar-B-Que 205 Manufacturers Rd. edleysbbq.com Southwind 7:30 p.m. The Feed Co. Table & Tavern 201 W. Main St.
FRIDAY4.19 Jimmy Dormire 6 p.m. Bela Lisboa 417 Frazier Ave. belalisboa.com Mark Andrew 6 p.m. Heaven & Ale Brewing Co. 300 Cherokee Blvd. heavenandalebrewing.com Dustin Concannon 6:30 p.m. Westin Dorato Bar 801 Pine St. westinchattanooga.com Etowah Jacks 6:30 p.m. Slick’s Burgers 309 E Main St. slicksburgers.com Amber Carrington 7 p.m. Oddstory Brewing Company 336 E. MLK Blvd. oddstorybrewing.co Ward Davis 7 p.m.
TUESDAY4.23 Sean Quinn 6 p.m. 1885 Grill 3914 St. Elmo Ave. 1885grill.com Preston Ruffing 6:30 p.m. Westin Dorato Bar 801 Pine St. westinchattanooga.com String Theory: David Finckel, Wu Han, and Gloria Chien 6:30 p.m. The Hunter Museum of Art 10 Bluff View Ave. huntermuseum.org Danimal 7 p.m. Backstage Bar 29 Station St. backstagechattanooga.com Space Jam Open Mic with Xll Olympians 7 p.m. Barley Taproom 235 E. MLK Blvd. chattanoogabarley.com Jonathon Wimpee 7:30 p.m. Westin Alchemy Bar 801 Pine St. westinchattanooga.com Freddy Mc & Friends 8 p.m.
tion” both have a unique sound that are examples of pure music. Both are original, thought-provoking, potent tracks. The stylish and one-ofa-kind Earthling is a true representation of the state of the music scene in the Great State of Tennessee. Music fans should support this Nashville sensation and check the LP out as soon as possible. lease that has jammed its way to the spotlight is the LP Nomad Theory by Nashville electronic music producer CoAtlas. Discovering Nomad Theory was like stumbling on a hidden diamond. I was especially excited that I found music I was able to connect with after tenaciously searching new sounds coming out of Tennessee. While there is a lot of good music out there to sift through, I patiently wait for hidden masterpieces—and Nomad Theory is just that, a masterpiece. Though Nomad Theory does have an overall EDM base, it goes far beyond the reach of genre confines. Each track paves its own way and heads in its own direction. There is somewhat of a jam feel to it, thought with a heavy synth, funky, dreamstate ambiance. There is not much music out there to compare it to, but that is when music is its best—when it does its own thing. According to CoAtlas’s Bandcamp page, “This fourtrack LP is a taste sampler of what CoAtlas will have in store for the future.” The LP blends live instrumentation with electronic elements of drum and bass, glitch hop, and psydub. There is not a dull moment throughout the entire LP. It starts with the gripping and entrancing “Freudian Slip”, which certainly gives the listener a good idea of what the music in the LP is going to be all about. While it sets the tone, it does not reveal the totality of the album; instead, the listener will witness it spiral into its own lifeforce. Standout tracks “Rise Again” and “Always & Forever” both use clever samples and can hit the audience in the heart if they are receptive to the music. Closed-minded people perhaps might not like Nomad Theory, but everybody else can jam on it without them. Support this Tennessee rising star. FREE WILL ASTROLOGY ARIES (March 21-April 19): French writer Simone de Beauvoir sent a letter to her lover, Aries author Nelson Algren. She wrote, “I like so much the way you are so greedy about life and yet so quiet, your eager greediness and your patience, and your way of not asking much of life and yet taking much because you are so human and alive that you find much in everything.” I’d love to see you embody that state in the coming weeks, Aries. In my astrological opinion, you have a mandate to be both utterly relaxed and totally thrilled; both satisfied with what life brings you and skillfully avid to extract the most out of it; both at peace with what you already have and primed to grab for much more. TAURUS (April 20-May 20): The Beat Generation of American poets arose in the late 1940s as a rebellion against materialistic mainstream culture and academic poetry. It embraced sexual liberation, Eastern spirituality, ecological awareness, political activism, and psychedelic drugs. One of its members, Jack Kerouac, tweaked and ennobled the word “beat” to serve as the code name for their movement. In its old colloquial usage, “beat” meant tired or exhausted. But Kerouac re-consecrated it to mean “upbeat” and “beatific,” borrowing from the Italian word beato, translated as “beatific.” I bring this to your attention, Taurus, because you’re on the verge of a similar transition: from the old meaning of “beat” to the new. LEO (July 23-Aug. 22): Many experts who have studied the art and science of running fast believe that it’s best if a runner’s legs are symmetrical and identical in their mechanics. But that theory is not supported by the success of champion sprinter Usain Bolt. Because he has suffered from scoliosis, his left leg is a half-inch longer than his right. With each stride, his left leg stays on the track longer than his right, and his right hits the track with more force. Some scientists speculate that this unevenness not only doesn’t slow him down, but may in fact enhance his speed. In accordance with current astrological variables, I suspect you will be able to thrive on your asymmetry in the coming weeks, just as your fellow Leo Usain Bolt does. VIRGO (Aug. 23-Sept. 22): Virgo adventurer Jason Lewis traveled around the world using transportation powered solely by his own body. He walked, bicycled, skated, rowed, pedaled, and swam more than 46,000 miles. I propose that we make him your role model for the next four weeks. You’re primed to accomplish gradual breakthroughs through the use of simple, persistent, incremental actions. Harnessing the power of your physical vitality will be an important factor in your success. GEMINI (May 21-June 20): “Scattered through the ordinary world, there are books and artifacts and perhaps people who are like doorways into impossible realms, of impossible and contradictory truth.” Argentinian author Jorge Luis Borges said that, and now I’m passing it on to you—just in time for your entrance into a phase when such doorways will be far more available than usual. I hope you will use Borges’ counsel as a reminder to be alert for everyday situations and normal people that could lead you to intriguing experiences and extraordinary revelations and life-changing blessings. LIBRA (Sept. 23-Oct. 22): Curcumin is a chemical found in the plant turmeric. When ingested by humans, it may diminish inflammation, lower the risk of diabetes, support cardiovascular health, and treat digestive disorders. But there’s a problem: the body is inefficient in absorbing and using curcumin—unless it’s ingested along with piperine, a chemical in black pepper. Then it’s far more available. What would be the metaphorical equivalent to curcumin in your life? An influence that could be good for you, but that would be even better if you synergized it with a certain additional influence? And what would be the metaphorical equivalent of that additional influence? Now is a good time to investigate these questions. that are genuinely available. SAGITTARIUS (Nov. 22-Dec. 21): “Sometimes I have kept my feelings to myself, because I could find no language to describe them in,” wrote Sagittarian novelist Jane Austen. I’m guessing you’ve had that experience—maybe more than usual, of late. But I suspect you’ll soon be finding ways to express those embryonic feelings. Congrats in advance! You’ll discover secrets you’ve been concealing from yourself. You’ll receive missing information whose absence has made it hard to understand the whole story. Your unconscious mind will reveal the rest of what it has thus far merely been hinting at. CAPRICORN (Dec. 22-Jan. 19): All over the world, rivers and lakes are drying up. Sources of water are shrinking. Droughts are becoming more common and prolonged. Why? Mostly because of climate change. The good news is that lots of people are responding to the crisis with alacrity. Among them is an engineer in India named Ramveer Tanwar. Since 2014, he has organized efforts leading to the rejuvenation of twelve dead lakes and ponds. I propose we make him your role model for the coming weeks. I hope he will inspire you to engage in idealistic pursuits that benefit other people. And I hope you’ll be motivated to foster fluidity and flow and wetness everywhere you go. The astrological time is ripe for such activities. AQUARIUS (Jan. 20-Feb. 18): A blogger named Caramelizee offered her definition of elegance: “being proud of both your feminine and masculine qualities; seeing life as a non-ending university and learning everything you can; caring for yourself with tender precision; respecting and taking advantage of silences; tuning in to your emotions without being oversensitive; owning your personal space and being generous enough to allow other people to own their personal space.”This definition of elegance will be especially apropos and useful for you Aquarians in the coming weeks. PISCES (Feb. 19-March 20): You Pisceans have been summoning heroic levels of creative intensity. You’ve been working extra hard and extra smart. But it seems that you haven’t been fully recognized or appreciated for your efforts. I’m sorry about that. Please don’t let it discourage you from continuing to express great integrity and authenticity. Keep pushing for your noble cause and offering your best gifts. I’m proud of you! And although you may not yet have reaped all the benefits you will ultimately sow, three months from now I bet you’ll be pleased you pushed so hard to be such a righteous servant of the greater good. grief contrasts with that of Louis. Louis, having never believed in an afterlife, is unable to see the danger hidden in the ground behind his house, while Rachel knows that sometimes true horror lingers on. There isn’t much that can be improved on in Pet Sematary. It’s expertly written and directed. The film breaks no new ground, but as a remake it may surpass the original in terms of quality. Pet Sematary is just another entry into the Stephen King renaissance in popular filmmaking. King offers strong source material and a competent writer and director can make very good films out of his ideas. Rather than remakes of films already attempted, it would be nice to see some of his other stories turned into films. King is nothing if not prolific—there’s lots of material to mine. Still, if remakes are going to happen, let’s hope they’re as high quality as Pet Sematary. they want to interact with it. It’s best to check the ego and be flexible. At the end of the day it’s all about having fun so that people want to come back next week.” Every two weeks Cro drives down from Sweetwater just to keep his current coDM campaign going with a few regulars at Infinity Flux. His friendly and inclusive approach to D&D gives him credibility as a skilled storyteller and game master. To Cro there is no wrong way to play these stories. The anticipation builds up just before six o’clock when the DM screen goes up and the game is on. “Not to take away from any other place, but I really love gaming in Chattanooga. This city has such a fun and supportive gaming culture. It’s just a joy to drive down here to do it,” he said. Spend just a rudimentary amount of time with Chattanooga’s gamer culture and you will find that this rings true no matter if it’s throwing dice, slapping cards, or dressing up. I’m just glad there are folks like Cro who blend a passion for gaming and fantastic storytelling with an eagerness to teach so that this culture of gamers thrives for years to come.